Some tips on this bosting business. Don't hurry. Check the plan against the finished planes. Check the depth of your cuts. Keep the final design of the piece in the back of your mind so that you don't overcarve. Stop work on the piece if you think you have gone far enough. Before you remove the carving from the hold-down, be sure that you have made all the rough cuts necessary to develop the internal planes of the piece. If you think that you can improve on the appearance of the piece by more bosting, wait and see. If you can, then do so. If you can't, let well enough alone. After all, it is in the art of bosting out where the final form is developed. The detail carving is the frosting on the cake. 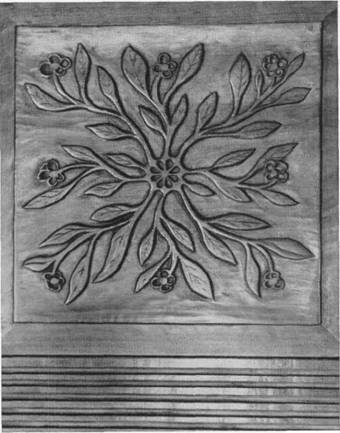 It is possible that you may wish to undertake the complicated process of making pierced carvings. This is the phase of the work where all the stock is cut entirely away from the front of the carving (the face) through to the back of the carving. In other words, irregular holes. The Imagegraphs of the Salem Eagle and Banners illustrate this phase of the work. Piercing can be done two ways. If you are working on stock less than an inch in thickness and are skilled in the use of the mallet and chisel, the holes can be developed in much the same manner as "sinkings"-that is, holding the tool vertically, mallet the tool into the wood, removing the surplus stock within the outline until the hole goes through the stock. The other and easier way to do it-in thicker stock certainly-is to drill or bore (with the bit brace and bit) a series of holes around the edge of the desired hole within the outlines, leaving a space of ?to 3/16 inch between the holes. These webs will prevent the stock in the center from fracturing away from the rest of the piece and thus crowding the tools you are working with. After all the holes are drilled or bored, the webs that hold the surplus stock in place can be sheared off with the quarter-inch skew chisel. Some care must be taken to see that, in boring, the holes are vertical. Care with the skew chisel is necessary to keep the cut vertical. Make the rough cuts for pierced work before you bost out the outline. You can carve across the holes readily enough. Finishing off the sides of a piercing with the skew chisel. To finish off the sides of a piercing, use the properly shaped tool to fit the outline and cut across the grain with the tool held at a slight skew to the face of the carvingall the while being sure the tool is held vertically. To make the final smoothing up of the piercing, use sandpaper. It all sounds complicated, but if you try a piercing in some waste stock by following the steps outlined above you will see it really isn't as difficult as words lead you to believe. Rifflers are files especially designed for use on wood or stone or metal. They are made in a variety of shapes and sizes. When using them, don't forget that the action of a file is to scour off the surface. The depth of cut will depend upon the pressure on the tool. 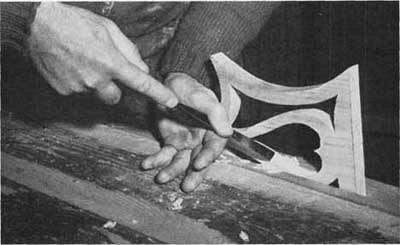 In addition to shaped rifflers, the woodworker's rasp is a most useful adjunct to the caiver. Oftentimes in bosting out projecting parts of a compound carving I use the rasp to remove the final stock. It is faster than using gouges or chisels on irregular curves. You cannot make finished cuts with rifflers or rasps. The filed surfaces will have to be carved with the properly shaped tools. After the bosting has been completed, the next step is to finish off the profile of the carving. To do this, remove the bosted piece from the hold-down and put it in the woodworker's vise. This is why you do not attempt to do any finished carving on the piece. To finish up the profile, use variously shaped chisels that best fit the curves of the outline and carefully pare off the stock so that all saw marks are removed and the profile has been reduced to the outline that you have designed. The care with which the outline is developed will determine the appearance of the finished piece. In some cases, it may be impossible to use a chisel to finish off certain parts. In this case, use rifflers that come closest to fitting the section. File off the surplus stock and finish up with coarse and fine sandpapers. This operation is shown in Images. Detail of carved chest carved in bas-relief owned by the Author.